Clearly, I am the reluctant food blogger. This space has taken a back seat to work. I now have 2 jobs – co-owner of a web design business that I run with my husband and now a hobby-turned-real-live-business, my greeting cards. It’s exciting to have 2 businesses that mean so much to me, but it also drives my life right into Crazy Town. I’m trying to find a balance between working and not working and somehow not having all my remaining free time gobbled up by True Detective (but seriously, that show, is just too freakin’ good). I’m trying to keep all my January intentions on the up and up. I did get the most comfortable short boots (thank you, Blundstone ), I’m working on being outside more, and me and soup are back to being best buddies. I wish my husband was cheering the soup thing right along with me, but we all have our things to work on. Don’t let my shoddy photos fool you, despite what’s depicted, this soup was a beautiful thing. The key to this soup is to use butter. The original recipe had 6 tablespoons worth – 3 upfront and 3 clarified with the spices to be added with the coconut milk near the end. I skipped over the last 3 tablespoons and felt there was still a good roundness of butter flavour. Try it both ways if you’re curious. Melt the butter in a large stock pot over medium heat, adding in the onions, celery and garlic, stirring once in a while until soft, lightly brown and fragrant. Add in a pinch of kosher salt along with the herbs de provence, the curry powder or paste, and the rest of the spices. 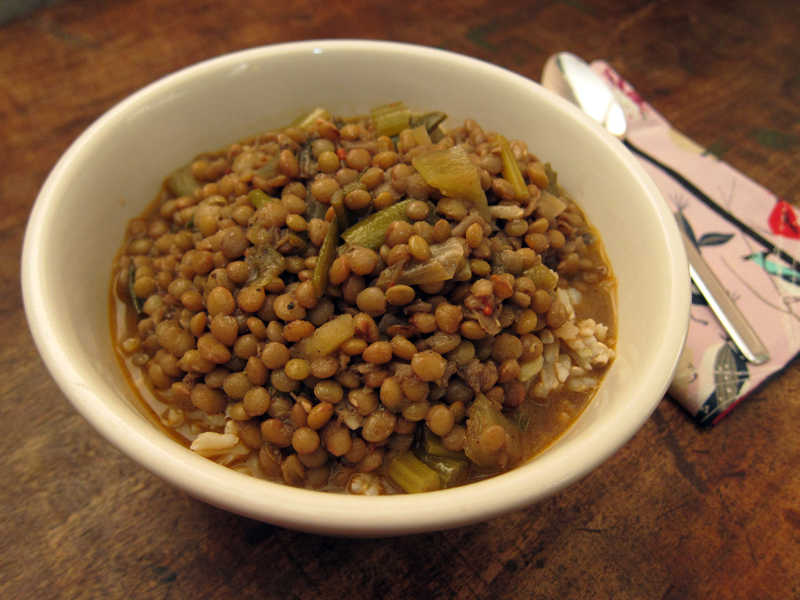 Stir in the lentils and pour in the vegetable stock. 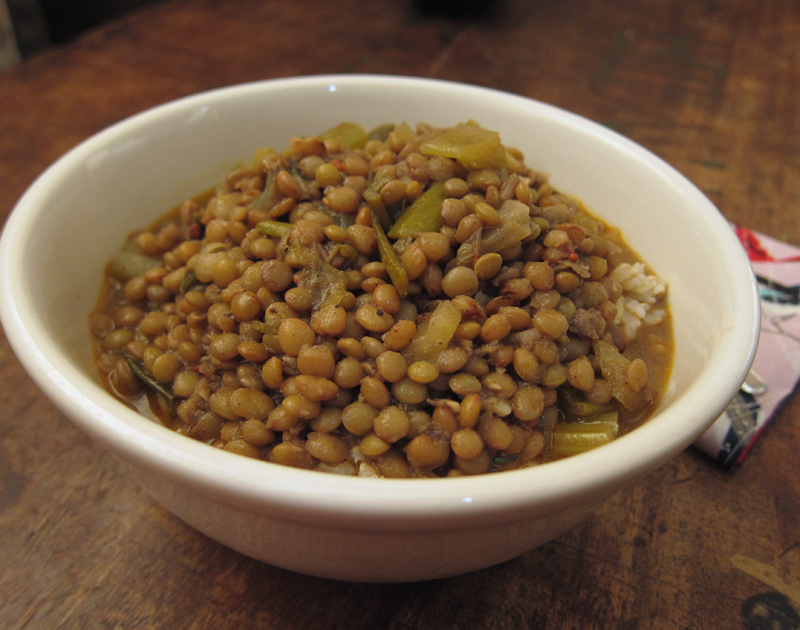 Simmer until the lentils are tender, about 30 minutes. Add in the coconut milk and a good grind of fresh black pepper, stir and simmer for another 15 minutes to blend the flavours. Taste and add additional salt or pepper if needed. Serve in large bowls with a squeeze of lemon or spoonful or yogurt, if warranted. Personally, I just ate the soup over a scoop of brown rice. It worked out deliciously. 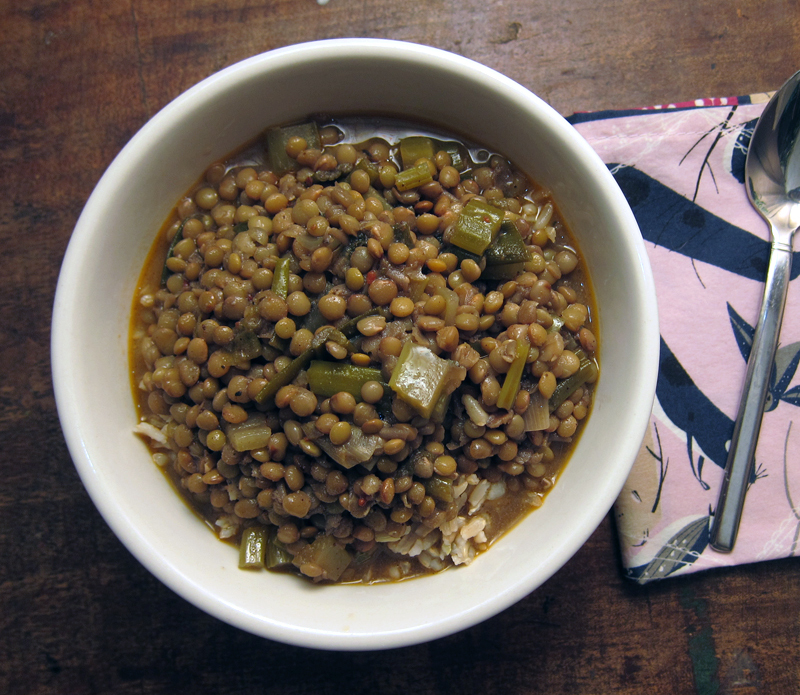 I love lentil soup and this sounds lovely!! You’re a busy one! This soup sounds absolutely lovely. I love all those spices! Congrats on having two businesses! How wonderful being able to work at the things you love. Your soup today sounds amazing. I am a big lentil fiend. I’m missing your frequent blog posts but I’m super stoked to hear that your card business is taking off! Yeah! Mmm, your lentil/coconut milk dish sounds like something I would enjoy. I love lentils and really miss eating them but have found that after not eating them for a while (6 months) they really don’t behave in my gut now. You’re the 2nd person to endorse True Detective. I’m starting to think I’m missing out on something. I’m anticipating new seasons of Mad Men and Orange is the New Black. Adding a 3rd tv series to my life will keep me homebound for good. We still have plenty of cold and snow on the ground so cozying up with a bowl of popcorn and a gripping tv show isn’t so bad, right? This soup sounds delish- warm, comforting and something I need to have right now. Coconut and spices smothering lentils. Luv it! Joanne, it’s a wonderfully warming soup! Cheri, thanks…but working is still WORK even if it’s something you love.